1969 - Kimnell Park. My first race on a 200cc Ducati. 1970 - Kimnell Park. 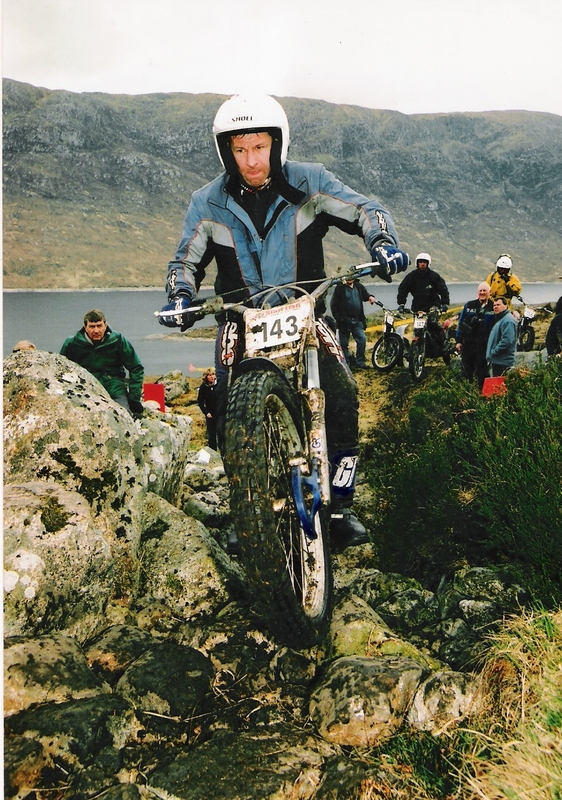 My first outing on my Honda CR93, with the late Trevor Rock in the background. 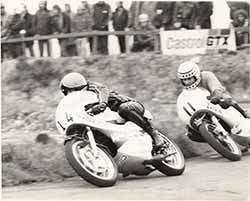 1971 - Kimnell Park, 125cc Race, being chased by Neville Watts. With Darley Moors Alan Wilson in the background. 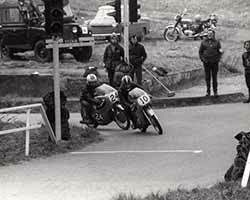 1971 - Kimnell Park, leading the 125cc Race. 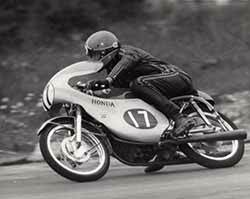 1973 - Darley Moor Hairpin, on the Pladdy’s Honda 3. 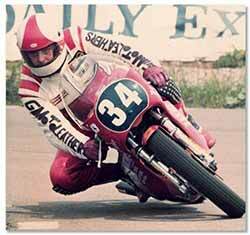 1974 - Darley Moor, on my Honda CR93 125cc. 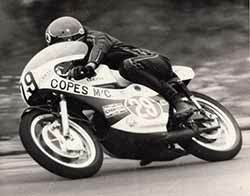 1974 - Darley Moor, on the Cope’s Sponsored, Championship Winning Yamaha TD3. 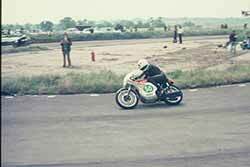 1974 - Darley Moor, on my Championship Winning ex Chaz Ford Yamaha TD3 with Pete Sproston in hot pursuit. 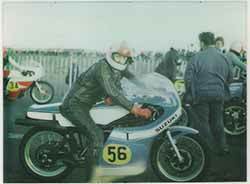 1978 - Carnaby Raceway, New Years Day Race. 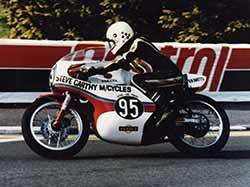 On the late Mal Carters Suzuki RG500 Mark II. 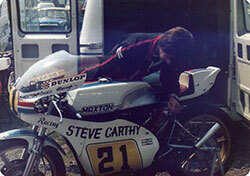 1979 - Oulton Park. 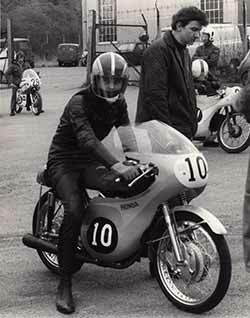 When Dave Hancock was a Yamaha man, getting the Maxton Yamaha 3 cylinder ready for Charlie Williams to ride. 1980 circa. Isle of Man TT Formula 3 Race. 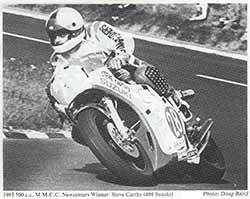 Neville Watts aboard my 250cc Yamaha. 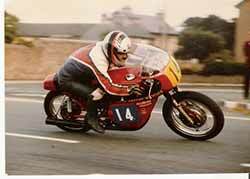 1981 - Jurby, Isle Of Man. 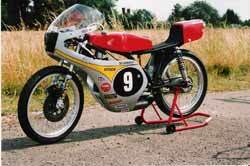 Testing Maxton Yamaha TZ350G, built for the late Stuart Jones to ride in the Junior Manx Grand Prix. 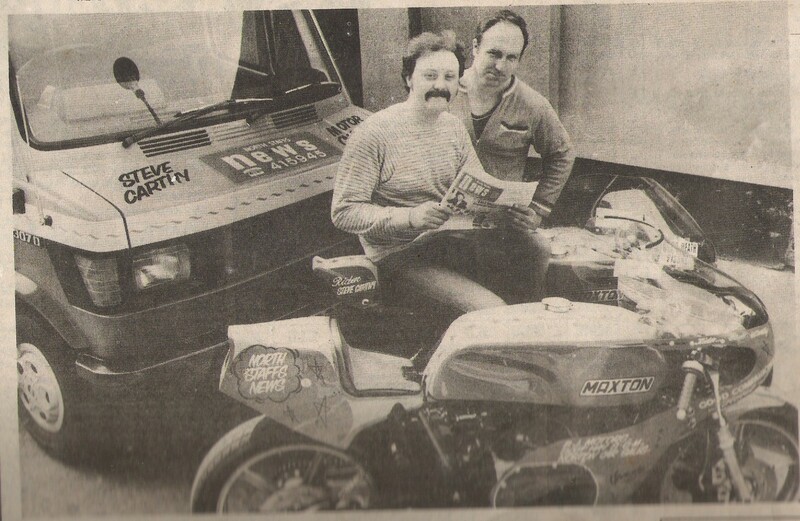 1983 - Preparing for the Manx Grand Prix Diamond Jubilee on my Suzuki RG500. 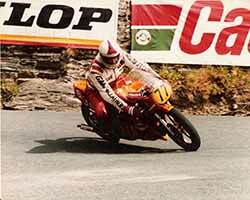 1983 - Isle of Man, Manx Grand Prix Diamond Jubilee. 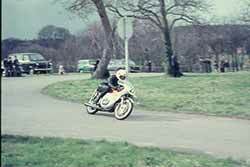 Aboard my Suzuki RG500 at The Waterworks. 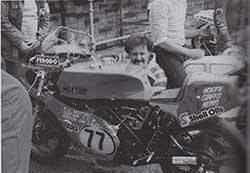 1983 - Isle Of Man, Manx Grand Prix Diamond Jubilee, after winning the 500cc Newcomers Race. 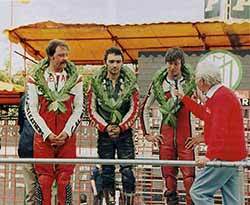 From left to right: Steve Carthy (myself), Robert Dunlop 350cc winner, Barrie Middleton 250cc winner, being interviewed by the late Peter Neale. 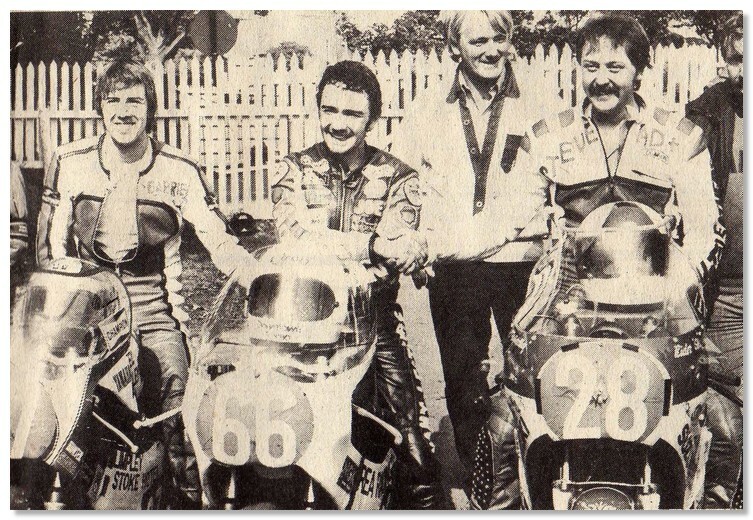 1983 - Isle of Man, Manx Grand Prix Diamond Jubilee. After winning the 500cc Newcomers Race standing behind me is my mentor Alex George. 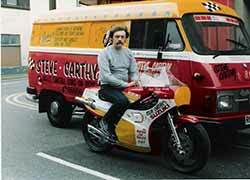 1984 - Isle Of Man TT. 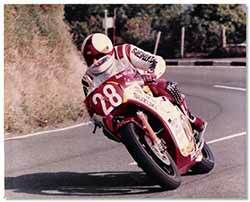 The Gooseneck, Senior Race, on the Maxton TZ350G. 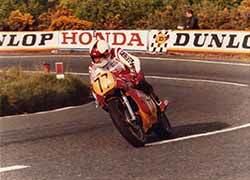 1984 - Isle of Man TT, Governors Bridge Senior Race on the Maxton Yamaha TZ350G. 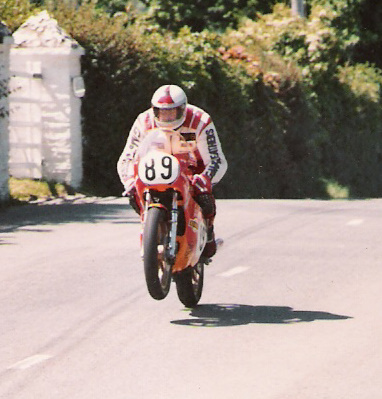 1984 - Isle of Man TT, at Ballacrye in the Classic TT Race. 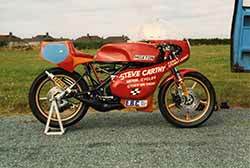 1994 - Est.1977 Steve Carthy Motorcycles, Tunstall, Stoke-on-Trent. 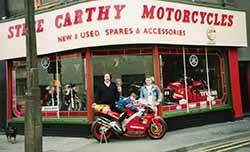 (my son Stephen Jnr and the late John Spong with myself, and Eddie Lawson’s Caciva 500cc GP Bike). 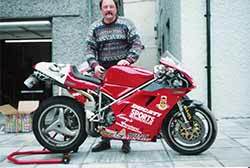 1994 - Isle of Man TT, Myself preparing the Sports Motorcycles Ducati 916 for the late Simon Beck for that years TT. 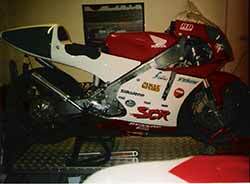 1994 - Isle of Man TT, in the assembly area for the Formula 1 TT Race working with Steve Wynn – Sports Motorcycles. 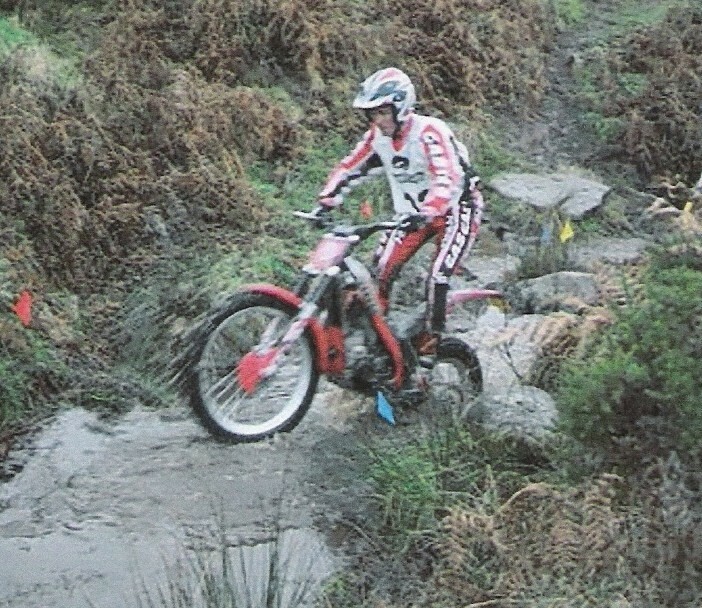 The rider was the late Simon Beck. 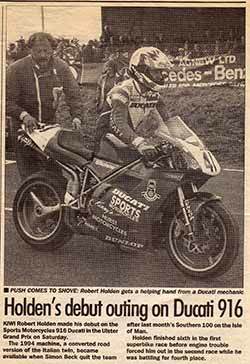 1994 - Ulster Grand Prix, Sports Motorcycles Ducati 916, helping Robert Holden at the start of the Superbike race. 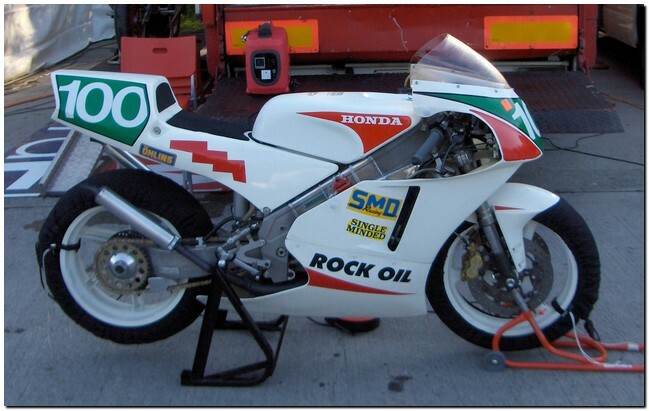 1994 - Honda MT125 1977 model. This was re-built by myself. 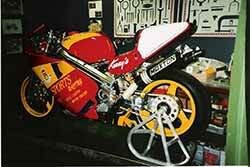 1995 - Spondon Engineering, Ducati 851, Re-built by myself on behalf of Sports motorcycles for Kevin Mawdsley to ride at the Stars at Darley Meeting. 1998 - 250cc NSU. 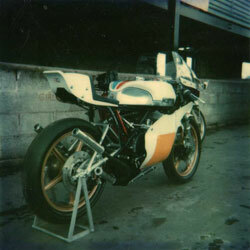 Re-built by myself and ridden at Schleiz, Germany and also at Jehonville & Chimay, Belgium. 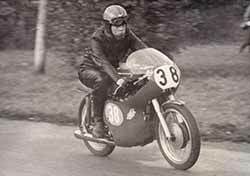 The Late John Spong aboard his Ducati 350cc at the Isle of Man Classic TT, on the Billown Circuit. 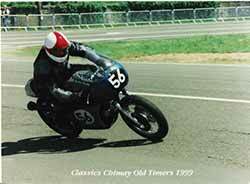 1999 - Chimay, Belgium, (Classic Chimay Old Timers), Riding Graham Boothbys ex works TGA 750cc Ducati. 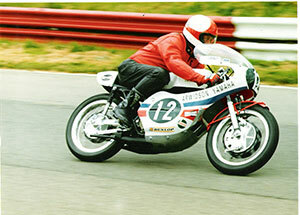 1999 - Yamaha TZ250A ex Christian Estrosi. 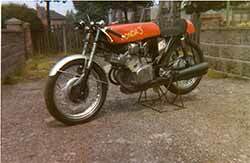 Re-built by myself as a Jarno Saarinen replica. 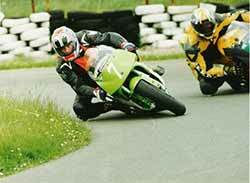 2002 - Jehonville, Belgium, aboard the TZ250A Yamaha. 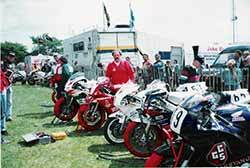 2003 - Stephen Carthy Jnr (my son), aboard a Honda RS250 at Darley Moor. 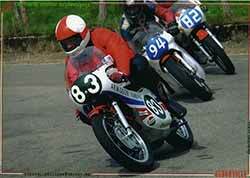 2004 - Mallory Park Race Circuit, myself on a 1974 Yamaha TZ250 ex Christian Estrosi. 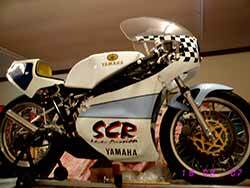 Spondon Yamaha TZ350G, re-built by myself in 2007. 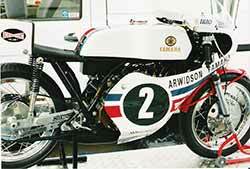 Honda RS250. 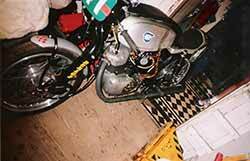 This was re-built by myself in 2007.